Hytera PD70X/PD70XG intrinsic safety radio is designed upon the requirements of USA UL913 and Canada CSA standard, the radio works safely in most hazardous environments with explosive gas and dust particles. PD70X/PD70XG is strictly compliant with MIL-STD-810 C/D/E/F/G and IP67 standards, ensuring outstanding performance even in harsh environments. Upgrade software enables new features without buying a new radio could also be switched into MPT and DMR trunking modes with corresponding license a applied in the same hardware. 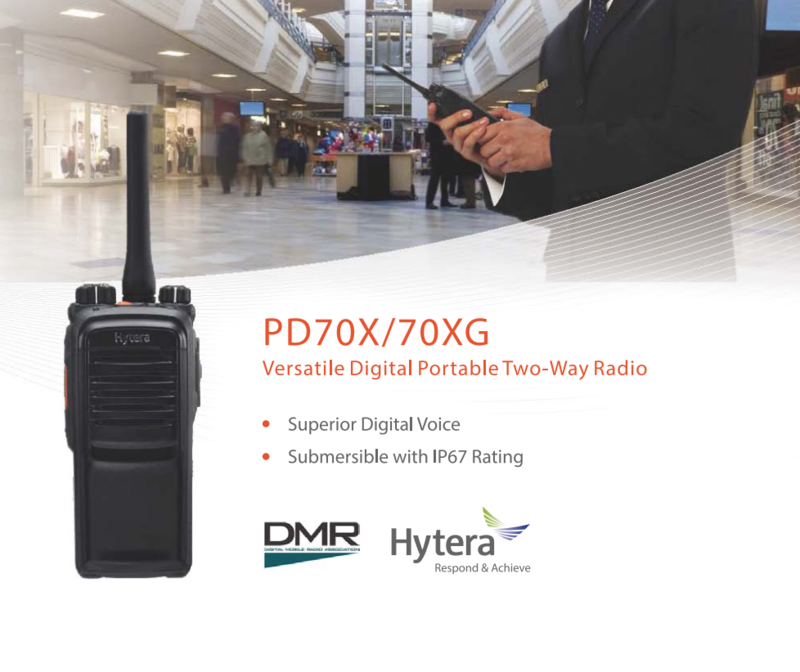 Based on DMR Technology Benefitted from the latest digital DMR technology, PD70X/PD70XG ensure your workers talk and hear clearly over excessive noise. With large PTT, volume, channel knobs and programmable buttons, PD70X/PD70XG are easy to operate even when wearing gloves. The PD70X/PD70XG with large and colour display(PD70XG only) and bright LED show status information at a glance. Equipped with 2400mAH and UL913/CSA certificated Li-Ion battery, PD70X/PD70XG provides with shift life of 18 hours under 5-5-90 duty cycle. And the battery life-span is longer as the charge/discharge cycles reduced. Benefiting from the TDMA technology, PD70X/PD70XG allows twice the channels based on the same spectrum resource. This is a big help to relieve the stress of increasing shortage in spectrum resource. PD70X/PD70XG can operate in either analog or digital mode. It is compatible with the prevalent analog system, ensuring a smooth analog-to-digital transition. Besides the basic encryption of the digital technology, PD70X/PD70XG provides enhanced encryption capability (such as 40,128, 256-bit encryption algorithm) and the Scrambler feature (selectable). PD70X/PD70XG supports data capabilities of sending Private, Group text message. It also supports Third Party to control the radio via Third party API (GPS, Radio Registration Services, Radio and Call Control, Telemetry*, Data Transfer*), via Telemetry control to radio. PD70X/PD70XG supports various analog signaling types (HDC1200, DTMF, 2-Tone and 5-Tone), various squelch control types (CTCSS/CDCSS), thus providing higher function expansion capacity to the analog world. PD70X/PD70XG supports supplementary services of Radio Check, Remote Monitor, Call Alert, Radio Enable and Radio Disable. Hytera PD70X/PD70XG provides a dedicated emergency button. In case of any accident, a press on the button will trigger an alarm and initiate a voice call to a pre-programmed work fellow or group. Built-in Man-down, GPS and Lone Worker functions are also a available with the digital portable. In addition to conventional communication services, PD70X/PD70XG features rich data services and selectable functions such as Text Message, Scan, Emergency, Man Down (optional), Auto Registration, High-speed Data Transmission and Lone Worker.